Last week, a parent asked for my advice about his teen daughter’s new interest in anime. I was down in Florida, visiting my own parents when I got the email. “What would you advise him?” I asked. Today, anime is more ingrained in popular culture than ever. Celebrities like Michael B. Jordan and Kim Kardashian West profess their love for it. And there are lots of adult fans like me who are old enough to sympathize with parents’ concerns about anime while still remembering what it was like to be a tween or teen discovering anime for the first time. So when uninformed parents need somebody to ask for advice, I’m thrilled when they go to me. Bill is one of those parents, somebody who found me through my Forbes page. He gave me his permission to repost a short version of his original email. I am the father of a 14-year-old girl who loves anime and doing art related to anime. Although she is a very intelligent young lady, she is still a child is so many ways. She has been very open with us about what she is doing online and her interests. Lately, she has been telling us about Anime Amino, a site where she posts her art and receives feedback. After reading the negatives from people on Common Sense Media, it appears that many of these anime and cosplay (not sure what this is exactly other than dress up) activities lead to sexual content at some point. If that is the case, or there’s a high likelihood of it occurring, I’m inclined to prevent her from going any further. Online addiction aside, if she can get some positives from these experiences then I would want to continue to support her efforts. Since you are very knowledgeable in these areas, I would really appreciate any thoughts you might have regarding our situation. When people write to me, I try to balance my adult mind with how desperately my young anime fan self simply wanted to be understood. That’s what I was channeling with I wrote to Bill. Anime is a medium of entertainment, not a genre. So there are many kinds of anime: action, comedy, drama, stuff for kids, and stuff for adults. Just like with the entertainment medium of movies, there’s anime that’s age-appropriate for your daughter and anime that isn’t. So where to start? Anime Feminist is a website organizing a list of anime that is good for teens and tweens. Beneath the Tangles is an anime blog for Christian anime fans and their families. There’s also Common Sense Media’s list of anime for kids. Maybe you could check out one of the shows on the list with her as a way to check it out while also showing interest in her and her hobby. As far as I know, Anime Amino is a forum for mostly teen participants. You can just scroll through it to see the kind of stuff kids talk about there. Additionally, it has a lot of stuff that’s against the rules, including hate speech and explicit words or imagery. Finally, it’s great that your daughter is being open with you about her activities because it shows a bond of trust. She’s not scared that you’re going to judge her or try to stop her from participating. I think that means that if she has a problem or does find content that makes her uncomfortable, she’ll feel comfortable coming to you about it. Thanks to the Anime Feminist team for helping me develop this response—especially the final paragraph. It’s important to remember that there are people of all ages in our community and to make it something kids still feel as comfortable as we did participating in (and something their parents feel comfortable condoning, too). 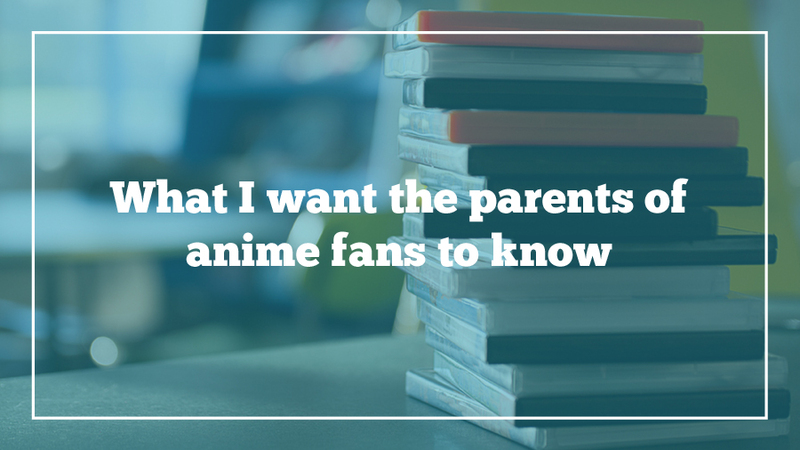 What kind of advice would you give to a concerned parent of an anime fan?